Our son does mostly well with staying quiet while we watch things together. We’ve been working on this for several years now, in no small part because we want him to be quiet and still and respectful of the audience when we see a movie in a theater. Most of the time he does a great and commendable job, especially when he sees that the program is pitched a little higher than his age level and he needs to pay attention. And this morning, Phil Hartman, in his final acting performance, had him talking and yammering through the film Kiki’s Delivery Service like he’d never seen a movie before. I think that he had to repeat every single one of Hartman’s lines at least twice, after he finished laughing. It wasn’t just Hartman’s dialogue, though. 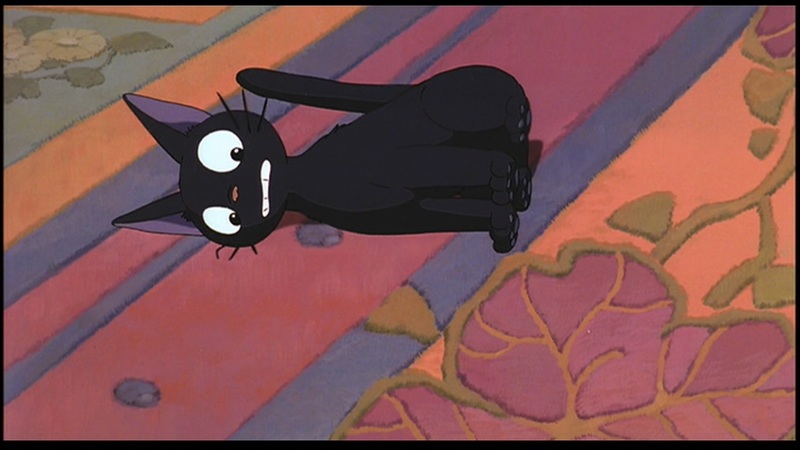 Whenever Jiji the cat did anything, he jumped out of his seat to imitate him. The cat curls up on the bed, our son curled up on the floor. The cat shakes itself dry, our son shook himself dry, and each time he added “He’s just like –” and then the imitation. At one point, Jiji tries to stay perfectly still, and I wished our kid would have taken the clue. Well, he wasn’t a truly well-behaved boy this morning, but he certainly had a great time. 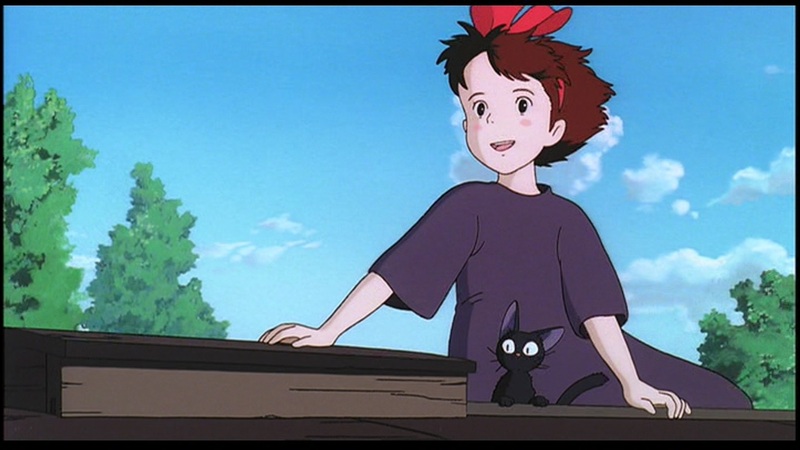 Kiki’s Delivery Service was written and directed by Hayao Miyazaki and was released in 1989. 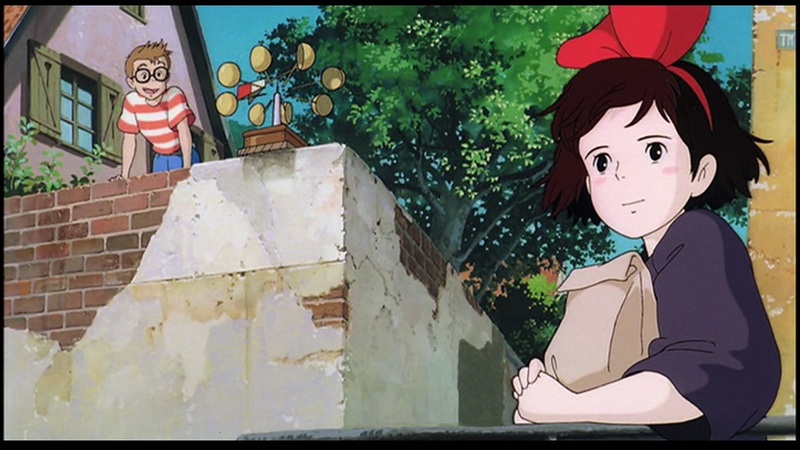 It’s based on a popular children’s novel by Eiko Kadono that was written a few years previously, though I understand that Miyazaki beefed up the slight story a good deal and gave it the dramatic climax, which is the downright definition of breathtaking. Last year, we enjoyed My Neighbor Totoro and I mentioned that my copy of that film is the first American dub, done by a company called Streamline. For Kiki, I upgraded my older Streamline dub for one that Disney put together in 1997, using the talents of Hartman, Kirsten Dunst, Tress MacNeille, and Janeane Garofalo. I’m glad that I did, and evidently our son agrees. He really loved this film. The story is about a thirteen year-old girl in a nebulous fantasy European country in the middle of the 20th Century. She’s a witch and the world doesn’t seem to have ever known war. At some point during a witch’s thirteenth year, she must leave home on a clear midnight full moon for a year. Kiki makes her way to a large port city. She’s very lonely, but she finds a home and starts a delivery business. She eventually allows herself to make friends in time to get some encouragement and inspiration when she loses her powers and isn’t able to fly anymore. Like several of Miyazaki’s other movies, I really enjoy it even though it’s so slight that it’s not a world I want to come back to every week. On the other hand, I’m pretty sure this won’t collect too much dust on the shelf before our kid wants to see it again. Hopefully he’ll tone it down a little next time!